Momofuku Milk Bar’s cakes are a labor of love but for the right occasion it is all so worthwhile. I have been eyeing the banana cake recipe for some time now and finally, I was able to take a stab at this showstopper for SB’s birthday. 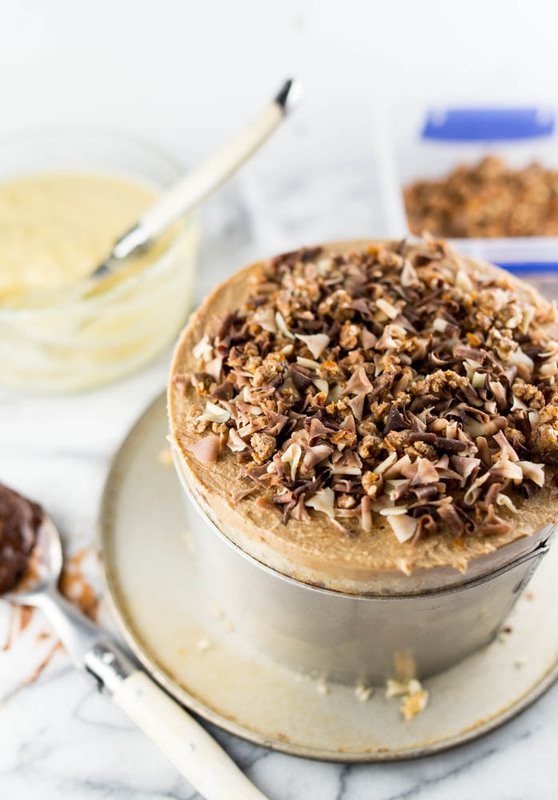 As with all of Milk Bar’s cakes, this one is another multiple step recipe that includes a banana cake as a base, hazelnut crunch, chocolate hazelnut ganache, banana cream and hazelnut frosting. This all might sound daunting at first but so many of these components are actually quite simple to make and can be done a few days ahead of time. The most difficult part of this recipe was actually trying to locate all the ingredients. It took me a few tries but I was finally able to find the banana extract and illusive gianduja chocolates (and no I did not order the 11 lbs blocks available on Amazon although it was tempting). I am not a fan of bananas but for some reason, I go bananas for banana flavored desserts. The base for this recipe is a dense buttery banana cake that resembles a pound cake. Using the ripest bananas will result in the best flavors. And even though at first I resisted using banana extract, I gave in and added the clear liquid and came out with a lovely moist base. In true Milk Bar fashion, there was a recipe within a recipe. 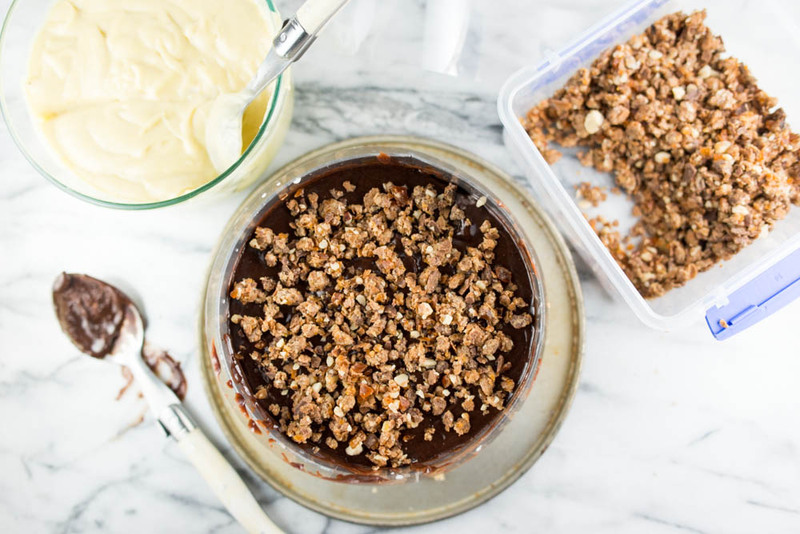 In order to make the chocolate hazelnut ganache, you need to make Milk Bar’s fudge sauce. Even though this is an extra step, it’s so worth it because you will find yourself eating the fudge sauce by the spoonful. Just make sure to save at least 1/4 of the recipe for the ganache though. And speaking of things you can’t stop eating, the hazelnut crunch is also extremely addicting. My friends and I pretty much devoured the 1/2 of the recipe that you don’t need to use for the cake by the fistful. They were fantastic on basically anything. And oh yes, feuilletine was also another extremely difficult item to find. I was actually never able to locate plain feuilletine but used chocolate covered feuilletine instead. There’s nothing wrong with more chocolate. Another crucial layer in the cake was the banana cream. Another fantastic stand alone recipe that you will be devouring. One key note, I am not sure why but the yellow food coloring that I used failed pretty miserably at giving me that lovely cartoon yellow color that was pictured. What I was left with was instead a mustard colored cream. Disappointed, I eliminated that minor ingredient from the recipe and can safely say that it didn’t really affect the end result that much. A more layers and finally – voila, we are done! 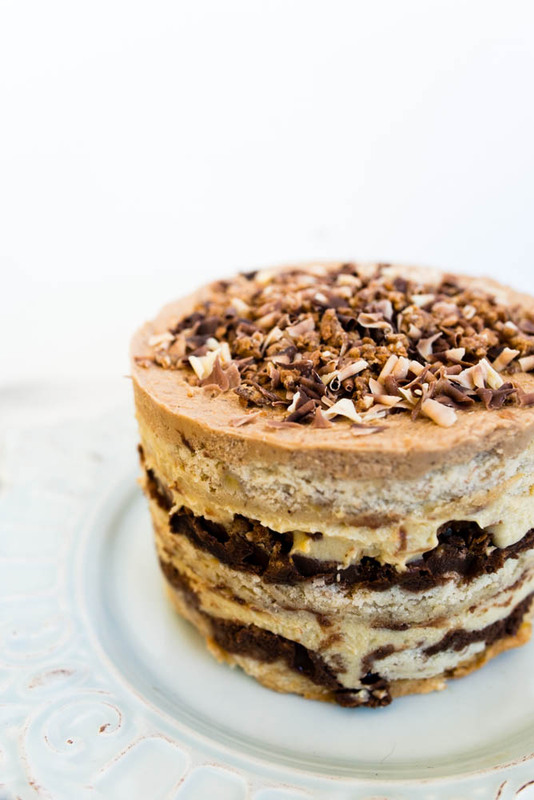 I chose to top the cake with a mixture of the hazelnut crunch and chocolate shavings that I found at the NY Cake and Supply Store. At least 12 hours in the freezer to set and another 3 to thaw, the cake was finally ready to be part of the party! This is one dense cake so don’t be fooled by its small diameter (only 6 inches across). 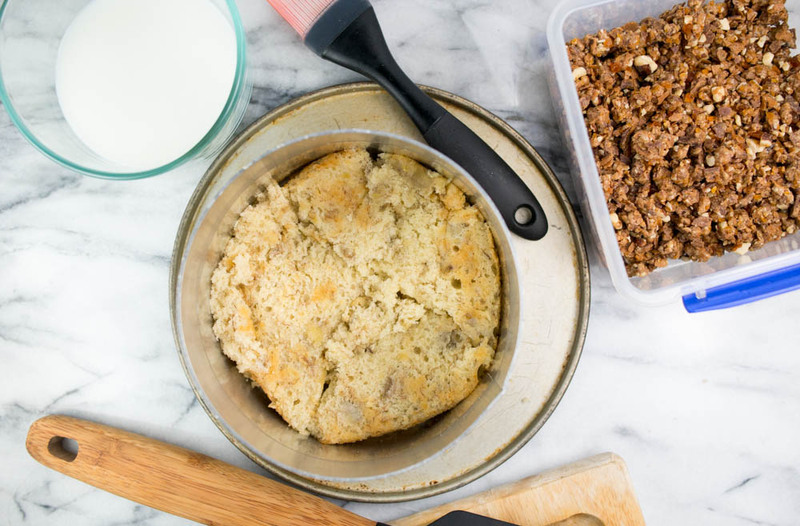 This banana cake will easily feed 6 to 8 people and I present you the step by step recipe following the cut. Put the cake scraps inside the ring and use the back of your hand to tamp the cake scraps together into a flat even layer. Dunk a pastry brunch in the milk and give the layer of cake a good, healthy bath of half of the milk. 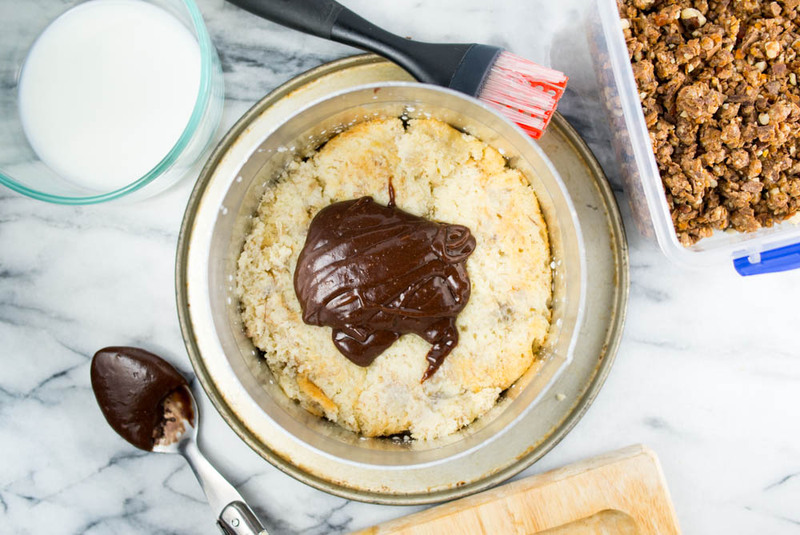 Use the back of a spoon to spread half of the ganache in an even layer over the cake. 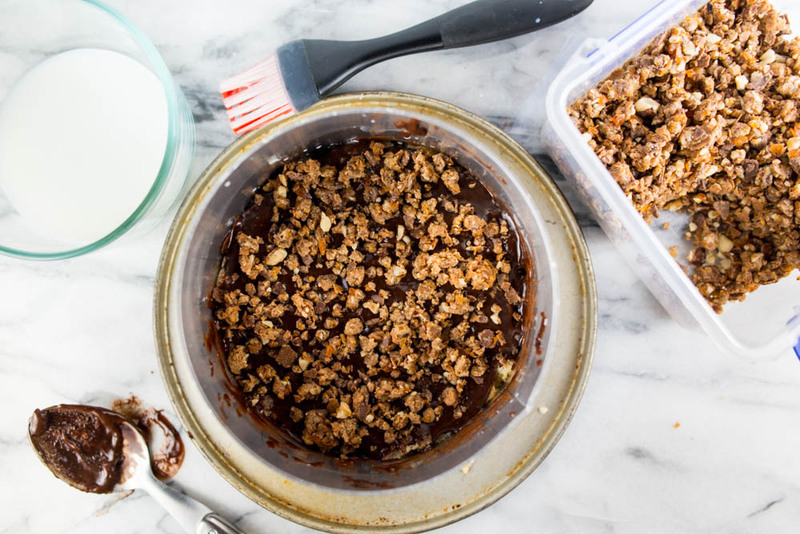 Sprinkle one-third of the hazelnut crunch evenly over the ganache. Use the back of your hand to anchor it in place. Use the back of a spoon to spread half of the banana cream as evenly as possible the crunch. With your index finger, gently tuck the second strip of acetate between the cake ring and the top 1/4 inch of the first strip of acetate, so that you have a clear ring of acetate 5 to 6 inches tall – high enough to support the height of the finished cake. Set a cake round on top of the banana cream and repeat the process for layer 1 (if 1 of your two cake rounds is jankier than the other, use it here in the middle and save the prettier one for the top). Nestle the remaining cake round into the banana cream. 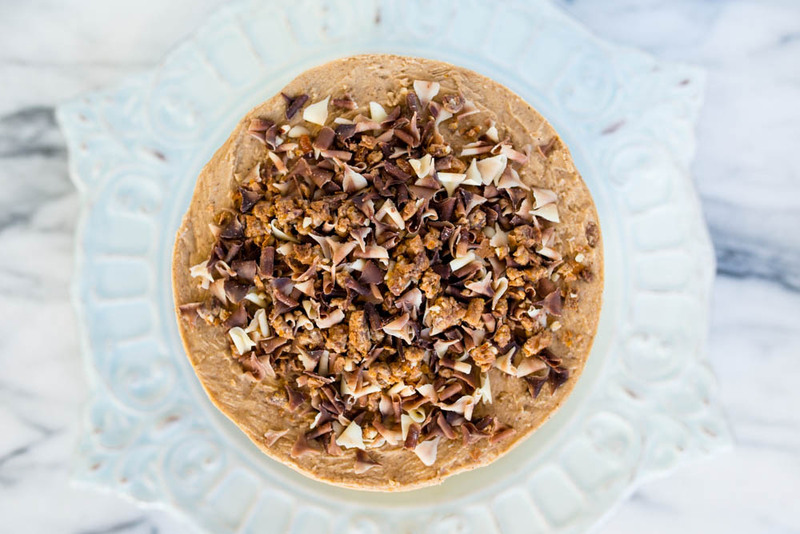 Cover the top of the cake with all the hazelnut frosting. Give it volume and swirls, or do as we do and opt for a perfectly flat top. Garnish the frosting with the remaining clusters of hazelnut crunch. At least 3 hours before you are ready to serve the cake, pull the sheet pan out of the freezer and using your fingers and thumbs, pop the cake out of the cake ring. Gently peel off the acetate and transfer the cake to a platter or cake stand. Let it defrost in the fridge for a minimum of 3 hours (wrapped well in plastic, the cake can be refrigerated for up to 5 days). Combine the butter and sugar in the bowl of a stand mixer fitted with the paddle attachment and cream together on medium-high for 2 to 3 minutes. Scrape down the sides of the bowl, add the egg, and mix on medium-high again for 2 to 3 minutes. Scrape down the sides of the bowl once more. Stream in the buttermilk, oil, and banana extract while the paddle swirls on low speed. Increase the mixer speed to medium-high and paddle for 5 to 6 minutes, until the mixture is practically white, twice the size of your original fluffy butter and sugar mixture, and completely homogenous. You’are basically forcing too much liquid into an already fatty mixture that doesn’t want to make room for it, so if it doesn’t look right after 6 minutes, keep mixing. Stop the mixer and scrape down the sides of the bowl. On very low speed, add the bananas and mix for 45 to 60 seconds to ensure all the bananas are broken apart. Still on low speed, add the flour, baking powder, baking soda, and sat and mix for 45 to 60 seconds, just until your batter comes together and any remnants of dry ingredients have been incorporated. Scrape down the sides of the bowl. Pam-spray a quarter sheet pan and line with parchment, or just line the pan with a Silpat. Using a spatula, spread the cake batter in an even layer in the pan. Given the bottom of your sheet pan a tap on the counter top to even out the layer (this cake batter is very forgiving). Bake for 25 to 30 minutes. The cake will rise and puff, doubling in size, but will remain slightly buttery and dense. At 25 minutes, gently poke the edge of the cake with your finger: the cake should bounce back slightly and the center should no longer be jiggly. Leave the cake in the oven for an extra 3 to 5 minutes if the cake doesn’t pass these tests. Bring the heavy cream to a boil in a small heavy-bottom sauce pan over medium-high heat. Meanwhile, combine the melted gianduja, hazelnut paste, fudge sauce and salt in a medium bowl. Pour the cream into the bowl and let sit undisturbed for 1 minute. With a hand blender or a whisk, slowly mix the contents of the bowl until the mixture is glossy and silky-smooth. This will take 2 to 4 minutes, depending on your speed and strength. Use immediately, or store in an airtight container in the fridge for up to 2 weeks; do not freeze. Combine the chocolate, cocoa powder, and salt in a medium bowl. Combine the glucose, sugar, and heavy cream in a heavy-bottomed saucepan and stir intermittently while bringing to a boil over high heat. The moment it boils, pour it into the bowl holding the chocolate. Let sit for 1 full minute. Slowly, slowly begin to whisk the mixture. Then continue, increasing the vigor of your whisking every 30 seconds, until the mixture is glossy and silky-smooth. This will take 2 to 4 minutes, depending on your speed and strength. You can use the sauce at this point or store it in an airtight container in the fridge for up to 2 weeks; do not freeze. 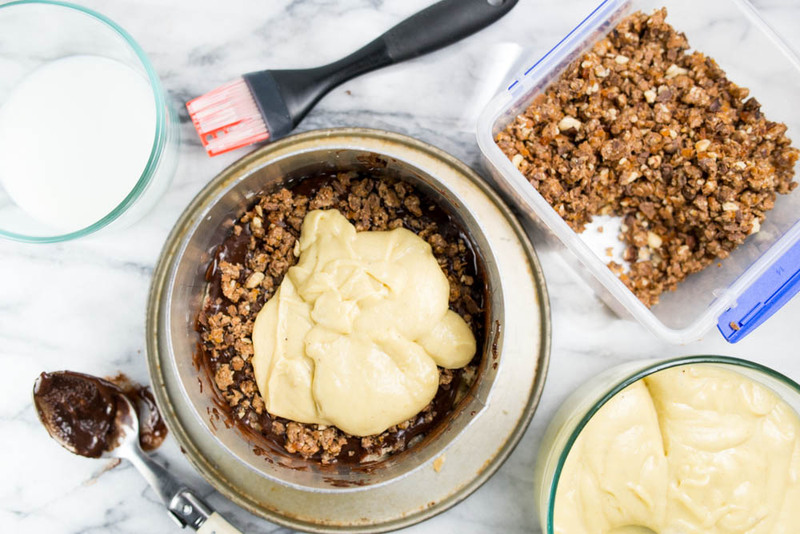 Combine the hazelnut paste, brittle, feuilletine, confectioners’ sguar, and salt in the bowl of a stand mixer fitted with the paddle attachment and paddle on medium-low speed for a minute, until homogenous. The crunch can be stored in an airtight container at room temperature for 5 days or in the fridge for up to 2 weeks. Line a quarter sheet pan with a Silpat (parchment will NOT work here). Make a dry caramel: Heat the sugar in a small heavy-bottom saucepan over medium-high heat. As soon as the sugar starts to melt, use a heatproof spatula to move it constantly around the pan – you want it all to melt and caramelize evenly. Cook and stir, coo and stir, until the caramel is a deep dark amber, 3 to 5 minutes. Once the caramel has reached the target color, remove the pan from the heat and, with a heatproof spatula, stir in the nuts. Make sure the nuts are coated in caramel, then dump the contents of the pan out onto the prepared sheet pan. Spread out as thin and evenly as possible. The caramel will set into a hard-to-move-around brittle mass in less than a minute, so work quickly. Let the brittle cool completely. In a zip-top bag break the brittle up into pieces as small as possible with a meat pounder or a heavy rolling pin – we grind our brittle down in the food processor to the size of short-grain rice. Eat or cook with it at will. Store your brittle in an airtight container, and try to use it up within a month. Combine the bananas, cream, and milk in a blender and puree until totally smooth. Add the sugar, cornstarch, salt, and yolks, and continue to blend until homogenous. Pour the mixture into a medium saucepan. Clean the blender canister. Bloom the gelatin: Soak the sheets in a small bowl of cold water. The gelatin is bloomed when it has become soft, after 2 minutes. If the gelatin still has hard bits to it, it needs to bloom longer. If it is so soft it is falling apart, it has overbloomed, start over. Gently squeeze the bloomed gelatin to remove any excess water before using. Whisk the contents of the pan and heat over medium-low heat. As the banana mixture heats up, it will thicken. Bring to a boil and then continue to whisk vigorously for 2 minutes to fully cook out the starch. The mixture will resemble thick glue, bordering on cement, with color to match. Dump the contents of the pan into the blender. Add the bloomed gelatin and the butter and blend until the mixture is smooth and even. Color the mixture with the yellow food coloring until it is a bright cartoon-banana yellow. Transfer the banana mixture to a heatsafe container, and put in the fridge for 30 to 60 minutes – as long as it takes to cool completely. Using a whisk or a mixer with the whisk attachment, whip the cream and confectioners’ sugar to medium-soft peaks. Add the cold banana mixture to the whipped cream and slowly whisk until evenly colored and homogenous. Store in an airtight container, banana cream keep fresh for up to 5 days in the fridge. Put the butter in the bowl of a stand mixer fitted with the paddle attachment and paddle on medium-high speed until it is completely smooth. Scrape down the sides of the bowl with a spatula. This is a small amount of ingredients so use your granny mixer now or take on the task by hand in a medium bowl. Add the hazelnut paste, confectioners’ sugar, and salt and mix on high speed until the frosting is fluffy and has no lumps in it, 3 to 4 minutes. Scrape down the sides of the bowl and mix for 15 seconds, just to be sure everything is nice and smooth. Use immediately, or store in an airtight container in the fridge for up to 1 month. Bring to room temperature before using. Thanks for posting this! So where did you find the hard to find ingredients such as gianduja chocolate, hazelnut paste, and feuilletine? I found the gianduja and hazelnut paste at Eataly in NY and the feuilletine from Amazon. I am sure Amazon carries gianduja and the hazelnut paste as well.